“Can you imagine learning how to tie your shoes without actually trying?” The same is true with innovation, creativity and teamwork. Ricard Huguet strongly believes in learning by doing as a way to achieve optimal learning and commitment of people while developing the required skills to succeed in the new challenging professional world. After working as innovation Director for the City of Barcelona and holding several management roles in technology-based multinational companies, Ricard founded invenio learn.by.doing, the leading learning solutions expert developing skills in the area innovation, creativity and teamwork. Ricard is confident that only by challenging people to discover can create a meaningful impact. Through a strong alliance with LEGO, he runs hands-on workshops around the globe for corporate audiences and educational institutions that are conceptually and physically designed according to achieve the companies’ objectives and harnessing the potential of the organization. The cornerstone of his learning by doing LEGO workshops is that listeners are transformed into active learners what ensures that everyone will leave from the room with a new perspective and that the message will be retained long after the workshop. Participants feel really engaged, motivated, committed with the output and fully satisfied with the learning acquired. By using this unique approach, he has already trained more than 250.000 people. 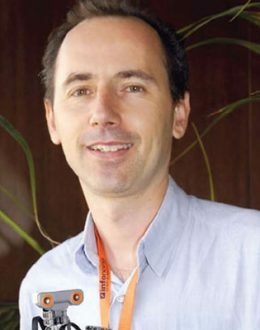 Ricard is also President of the organization that manages all internet domains of Catalonia (.cat), is Vice-President of the MIT Alumni Club of Spain, and President of Scientia Foundation, his own private foundation to foster scientific vocations among kids. Ricard earned his MBA at MIT Sloan School of Management where he focused on innovation culture and change management. He is a co-instructor with Henry Chesbrough and Ken Morse in the “Open Innovation and Corporate Entrepreneurship” program. He also owns a degree in Business Economics and a Bachelor of Science.